The kids are back at school. My daughter came home from school the other day sharing about the different types of stories that they are talking about at school. She asked me what my favorite type of stories are and I told her suspense. There is something in the style of Carol J Post that I just really enjoy. From the very first page, the reader is pulled into the story. She starts off quickly and then finds the right pacing to provide the details to help develop characters that you feel like you know and in settings described so you can picture the scene, all while keeping the story moving forward down a suspenseful pathway. Whenever I read suspense or mystery books, I am always trying to find the clues and figure out who-dun-it or what is really going on. I usually have several theories over the course of the book, as each of them is disproven I find myself reconsidering the clues and trying to find a new theory. In Reunited by Danger, I was able to figure out the killer pretty early in the book. Of course, I didn't know I knew until I knew, but when I found out I had read the right clues, it was almost frustrating, even disappointing. My reaction was a surprise to me, I would have expected to be excited at my ability to read the clues, rather than disappointed that I had known as long as I did. Don't get me wrong, even though I had figured it out, since I didn't know I had figured it out, I still fully enjoyed the story development. One unique thing about this story is that all of the main characters have known each other since high school, although several had not seen one another in the 10 years since graduation. With even the detective having attended high school with them, there was a unique dynamic and familiarity between the characters and in some ways, the detective had an advantage in knowing the back stories of those in the story. Another aspect of this book that I found to be interesting was the previous relationship between Amber and Caleb from when they were younger. In most romances that I’ve read where the two main characters knew each other in high school, they either dated each other, at least one of them had a crush on the other, there was an unrequited love situation between the two, or there was some kind of pretty big history between them in some other way, but for Caleb and Amber, they were simply acquaintances in high school, not in some kind of relationship with each other. I found that deviation from the typical plot line to be refreshing. It gave their developing relationship a different feel than in other books I’ve read and I appreciated that. When a former classmate is murdered at Detective Caleb Lyons's ten-year high school reunion, he knows the victim's old group of friends are keeping secrets. That includes Cedar Key, Florida, police officer Amber Kingston. Back in school, Amber was headed for trouble, but now she's as dedicated to the law as he is. As he works overtime to get the pretty cop to open up to him, Amber and her friends receive messages threatening payback for past deeds. And her friends keep dying…one by one. But protecting Amber and unmasking a murderer isn't just the widowed detective's shot at redemption—it's his unexpected second chance at love. I thoroughly enjoyed reading this suspenseful love story and have recommended it to friends. 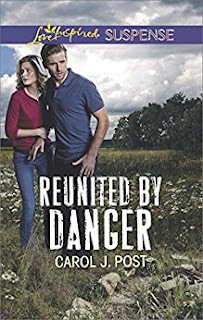 If you enjoy suspense stories, check out this book and others by Carol J. Post.